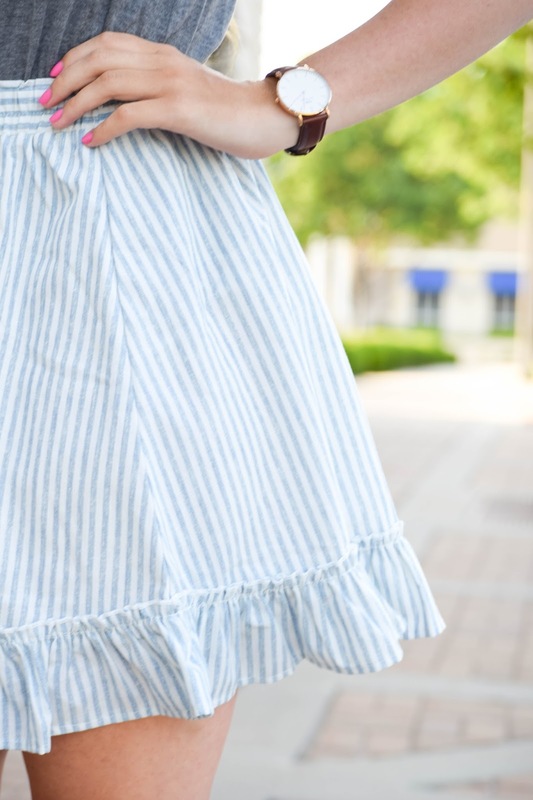 A classic stripe with a hint of ruffle...loving this simple look to beat the heat! Is it safe to say that skirts have made a comeback recently? Prior to this year I think I owned one or two skirts, but now they're all I want to wear! I got this striped one from Scoobie and paired it with a simple gray tank. I think this skirt would look so pretty with tons of tops like the one shoulder top I styled HERE, a flowy white button-up or an off the shoulder top, but for the midday heat this comfy racerback was the way to go! If you're following along on Instagram you would know that I'm in California now! I had so much fun exploring the urban jungles of Seattle and Portland, but I've anxiously awaiting going back to California for three years now. Content about my trip will be on the blog later in the month, but for now I really just want to be in the moment so follow along on Instagram to follow me around!